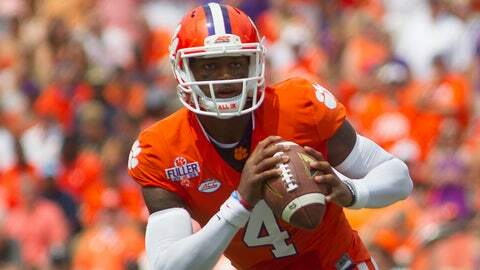 Clemson quarterback Deshaun Watson and the No. 12 Tigers will host No. 6 Notre Dame this Saturday. The first and only time Notre Dame stepped foot on Clemson soil was on Nov. 12, 1977, in a matchup between two top-15 teams with their eyes on a national title. The contest produced 36 NFL players, 14 Super Bowl winners and seven first-round draft picks. It also produced the eventual national champion. With Notre Dame ranked sixth and Clemson 12th heading into Saturday night’s game in Death Valley, it’s hard to not draw parallels to the teams’ first meeting there. The media was in a frenzy. The matchup drew the most national interest in Clemson history at the time and to this day ranks second only to the 1999 Bowden Bowl in terms of pregame buzz. The game did not disappoint. Led by a young quarterback named Joe Montana, the No. 5 Fighting Irish overcame a 10-point, fourth-quarter deficit to score a 21-17 victory over the No. 15 Tigers. Montana marched his team into the end zone twice in the final eight minutes, clinching a win over a Clemson team that featured future San Francisco 49ers teammate Dwight Clark, who would go on to make “The Catch” in the NFC championship game at the end of the 1981 season. Fast forward to this weekend. Two top 15 teams with national championship dreams? Check. Media frenzy? Check. Star quarterback and a slew of NFL talent? Check and check. Last 40 years … we’ve won one national championship. It’s hard to do. Georgia has won one, we’ve won one. Everybody is chasing that ultimate — now it’s 15-0. It gets harder and harder every year. Yes, like the late, great Yogi Berra once said, its déjà vu all over again. Except the Tigers are hoping that isn’t exactly the case. The loss to Notre Dame is just one of a few instances in Clemson history where its national title dreams came to a screeching halt. In 2011, the Tigers busted out of the gate with an 8-0 start only to have their championship dreams derailed by ACC rival Georgia Tech, which rumbled its way to a 31-17 victory. In 2013, Clemson won its first six games before Jameis Winston and the Florida State Seminoles dented its perfect record with a 51-14 thrashing. Saturday’s game doesn’t promise a College Football Playoff appearance to the winner, but it virtually guarantees the loser will be watching the national title game from home. “This game is the biggest game of the year simply because it is one step closer to being the best,” Clemson coach Dabo Swinney said. “That’s what we’re ultimately trying to do around here. It’s hard to do. Clemson, whose lone national championship came in 1981, has scored 15 wins over teams that were ranked in the top 10 of at least one poll in its history, with five coming during the Swinney era. A win would go a long way toward silencing the naysayers who claim Clemson can’t win the big game, and Tigers standout defensive end Shaq Lawson can’t wait for the opportunity to do just that. “We are going to show everyone in the world what we’re made of and make people see what we are made of,” Lawson said.